I love it when I see mother and daughter carry Balenciaga bags together! This time it is Hilary Duff and her mom Susan who are sporting the brand. Hilary and her mom were spotted on June 29, 2011 going out to lunch in Beverly Hills. Hilary carries her S/S 2011 Militaire Classic Work and Susan carries a lovely Covered Hardware Giant City in what I think is Praline or Sahara. This shows that Balenciaga is an ageless brand that is great for any woman. Balenciaga will release another fragrance in September which will be stronger than the previous Balenciaga Paris perfume from last year! I think this bottle is so much prettier than the previous year's. 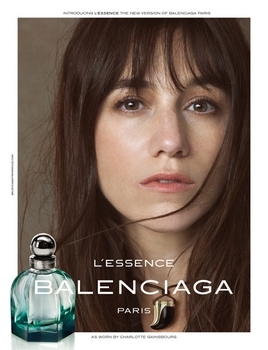 Once again the lovely Charlotte Gainsbourg will front the new fragrance. Check out the cool video featuring both her and Nicolas Ghesquiere. I can't wait to see how they will promote this perfume.. more adorable pouches as gift with purchases?! L'Essence Fragrance is now available for purchase online here at Bergdorf Goodman right now! Balenciaga will launch Balenciaga Paris L’Essence, a new fragrance for women, in September. L’Essence is a stronger variation on last year’s Balenciaga Paris, “a sequel and a new beginning”. L’Essence wants to say it all and yet it is a liquid enigma. L’Essence is green. L’Esssence is impulsive. L’Essence is unambiguous. On the skin, L’Essence is as pure as the searing honesty of short-lived flowers. Violet leaves are like a blast of woodland and their youthful energy stimulates the skin. Violet leaves are unfailingly honest and offer up their exquisite coarseness. Vetiver also takes the upper hand, wild, unruly and incisive… L’Essence engages and dazzles with its modulations. And the secret of the forest asserts itself… L’Essence, is also reminiscent of the mossy scent given off by forests at certain times of day, which emphasises the accent of conifers. 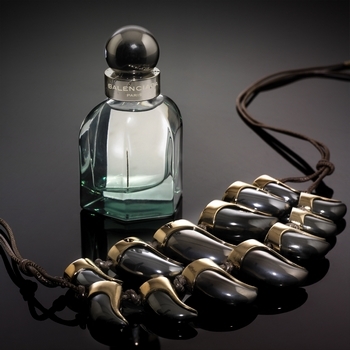 It is like the fragrance of leather, but it expresses the intrinsic nobility of the organic world. 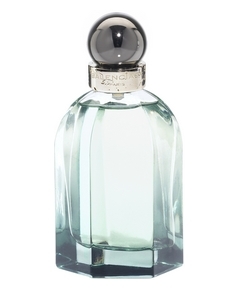 Balenciaga Paris L’Essence will be available in 30, 50 and 75 ml Eau de Parfum. Nicky's black City is so to die for that it's worth blogging about again! She looks casual chic while out shopping in West Hollywood on June 24, 2011. When Nicky carries her Balenciaga she rotates them fairly often.. so more Bal sightings for us! Even after 7 years her bag still looks to be in excellent condition! Nicky Hilton was spotted out with sister Paris in Malibu on June 22, 2011. This time she carries another Balenciaga oldie, a Seafoam Twiggy with Pewter Hardware from 2004! The color Seafoam is a lovely and fresh pastel green that is perfect for warm weather outfits. In 2004, Balenciaga also had another pastel green which was light turquoise that was slightly brighter and bluer than the Seafoam.. both colors are stunning! Similar pyramid stud bracelet by Melinda Maria here or by Forever21 here only $7! 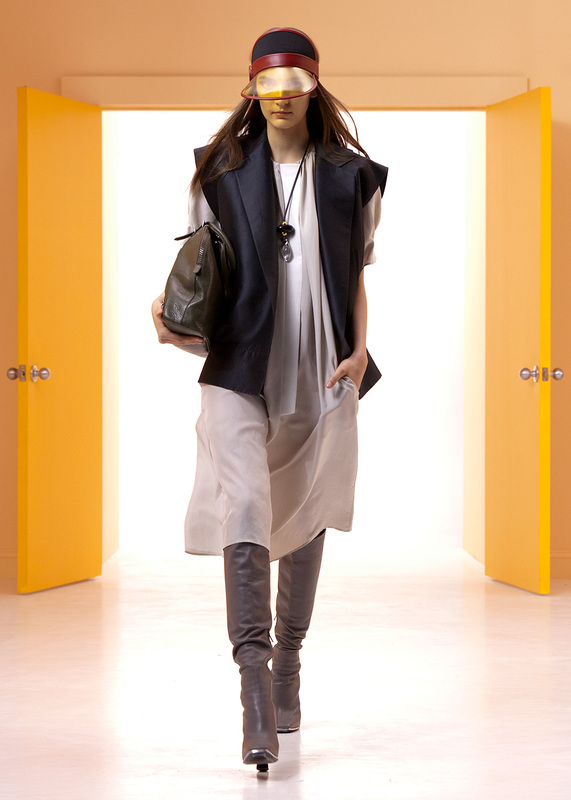 Even though we haven't even seen all the pieces from F/W 2011, rumors are swirling about what's up and coming for S/S 2012! Please note that my source is not completely credible, but I have compiled a color chart of what may be coming our way for next season! Total excitement. I'm loving all these rumored colors. A true lilac/lavender is what I've been waiting for. I've also read on the Purse Forum that they might also discontinue Giant Hardware! If this is true, it will be a huge disappointment for many fans. To soften the blow they will replace it with the "mini" Giant Hardware (size of classic hardware) that we've seen so far on the First and the Coin Purses. I do love Giant Hardware but hate the heaviness of it.. so I'm kind of looking forward to seeing how the City would look like.. so I made a "rough" (excuse the bad photo-shopping, I used Paint!) interpretation below after the runway photos. There is also a rumored price increase which is disappointing.. but I'm not surprised since they are probably taking cues from Chanel who just had their hefty price increase last month. On the plus side, they may also be making adjustable straps on some of the bags as well! 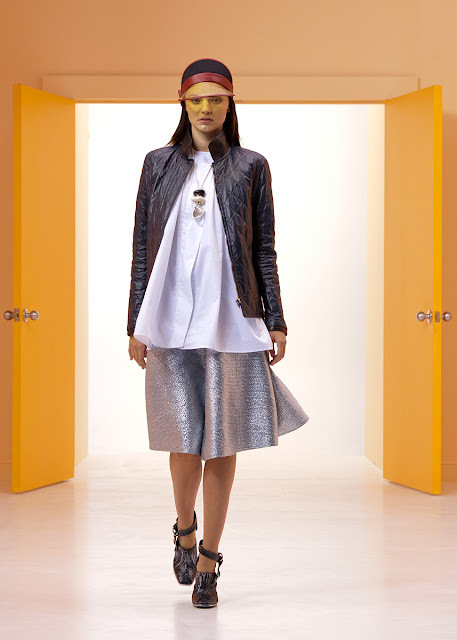 Also, Vogue.com has uploaded photos from the Resort 2012 Collection courtesy of Balenciaga. There are some beautiful looks with lots of bold colors and I spy lots of a-line skirts! 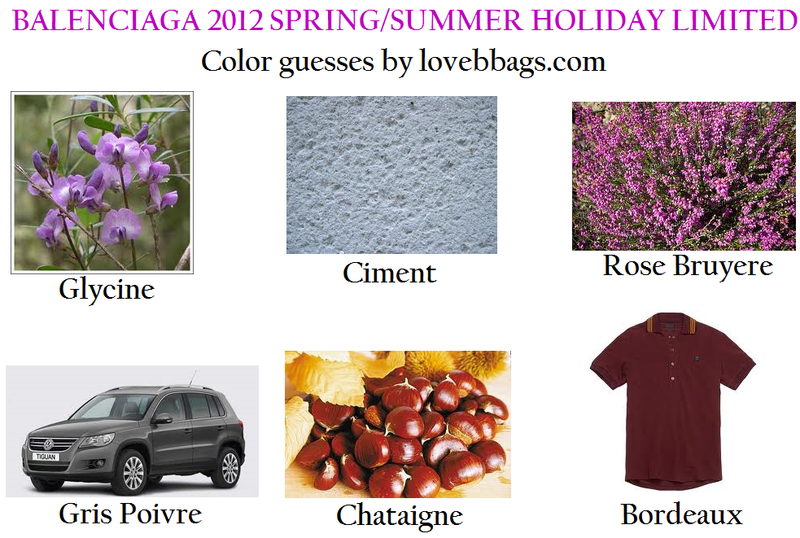 ETA: More color information for Spring 2012 via tpf. 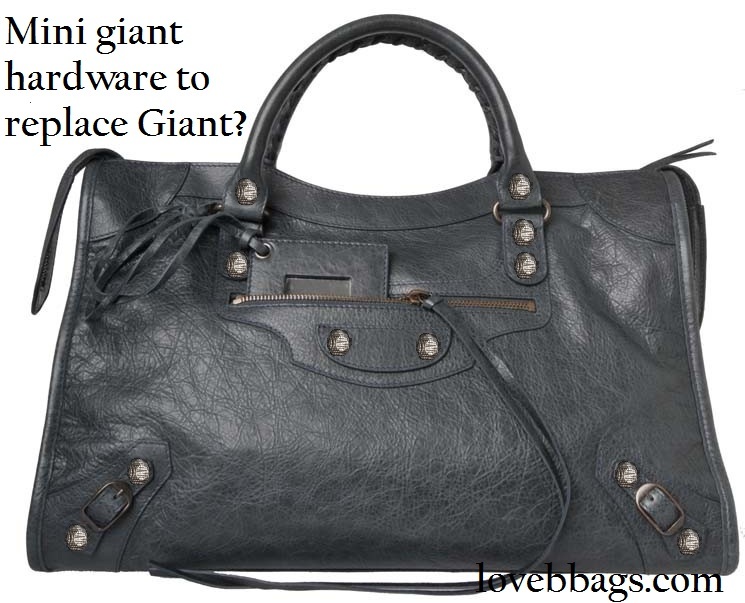 ETA 8/15/11 - ChloeGlamour from TPF shared a new picture of a S/S 2012 Part Time with the Small "Silver Giant Hardware"! What do you all think? It's definitely something to get use to.. the handles are thinner too! Reality television star Kim Kardashian was spotted arriving at JFK airport today on June 23, 2011. She is one of the first celebs I've seen with a F/W 2011 Balenciaga bag! The bag she carries is a gorgeous Blue Paon Classic City. It is a lovely pop of bright blue against her black outfit. Bridget Moynahan was spotted walking to the car with boyfriend Joseph McGinty Nichol after leaving Sunset Plaza on June 21, 2011. The black Classic Work bag that she carries is perfectly proportional to her 5'9" height. The Classic Work is a bigger version of the Classic City but without the shoulder strap.. perfect for those who need to carry a good amount of things during the day. Nicky Hilton was also spotted today carrying her white Balenciaga Classic City in West Hollywood. The City in white is also another great alternative to everyone's favorite neutral black and also makes a great spring colored bag. My only complaint is that it is so difficult to keep white bags clean but Nicky is doing a good job! Mom of Miley Cyrus, Tish, was spotted out for lunch at Wagamama restaurant out in Sydney Australia on June 20, 2011. Both Miley and Tish are carrying Balenciaga bags. Tish carries a large Sunday Tote in what I think is Praline, and Miley carries her lovingly worn Galet Pompon with Gold Hardware. I'm totally coveting Miley's LV scarf and Chanel flats! Dutch model Lara Stone was spotted out and about in North London on May 21, 2011. She manages to make a Wholefoods Market tote look chic! 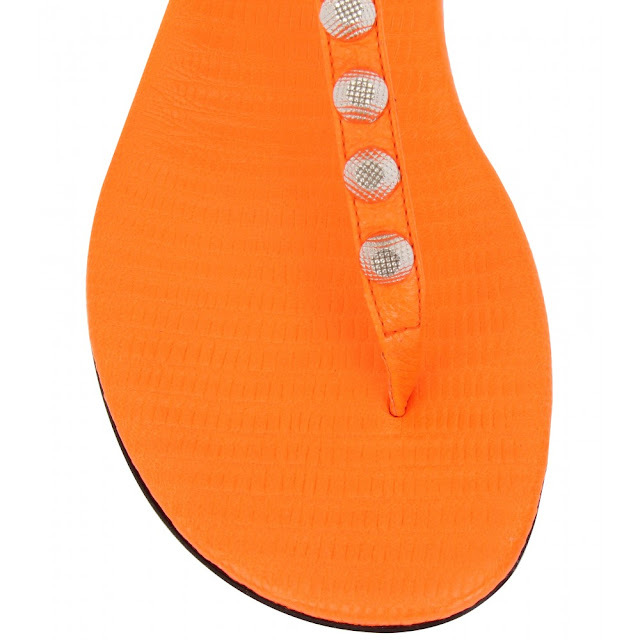 She wears black studded Balenciaga flats to complete her casual look. I'm still loving mine.. my total go-to comfort shoes. 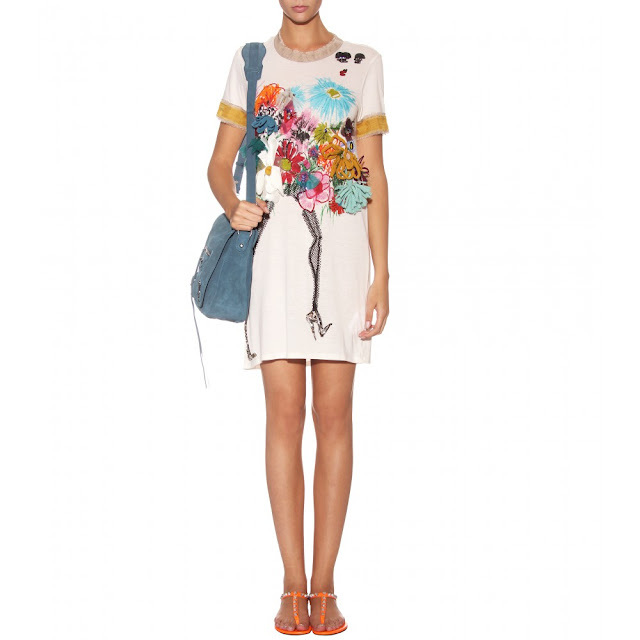 MyTheresa has received a few lovely items from the pre-fall collection which includes footwear and a few bags. They photograph their merchandise beautifully and even have a model to show how it would look when worn! Just gorgeous!